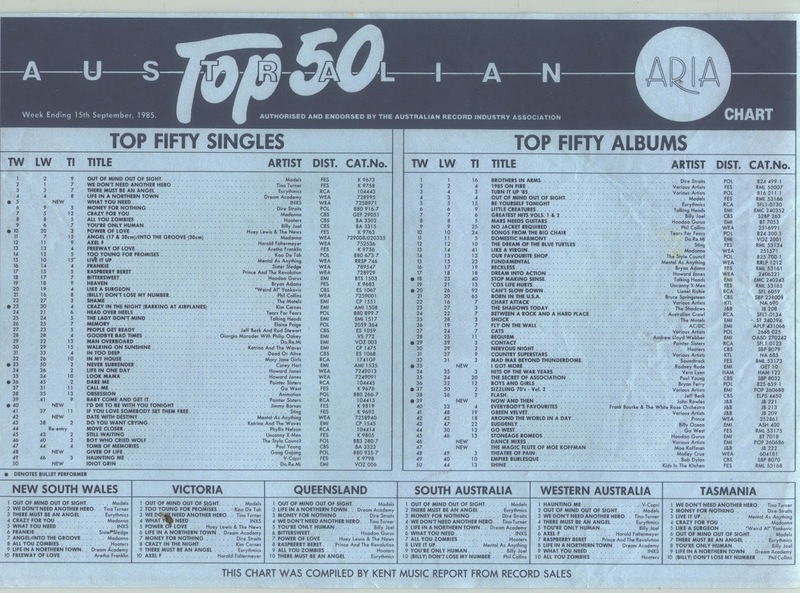 If you ever needed any proof that Australian music was in a pretty healthy state in the mid-'80s, you need look no further than the ARIA top 50 singles chart from this week in 1985. All five of the new entries were from homegrown acts, while another held down the number 1 spot. The week's highest debut came from an act that was already Australia's biggest band and was on the verge of international superstardom. The lead single from their fifth album would change everything for the Sydney six-piece. At number 1, Models scored their first - and only - chart-topper as "Out Of Mind Out Of Sight" nudged Tina Turner aside for week one of a two-week stint on top. The first - and biggest - of four UK top 10 hits for the prog rock band, the success of this single prompted the sudden uptake of the name for baby girls in Britain. Originally recorded by writer Jimmy Webb and later covered by Glen Campbell, this country classic also provided the name for the supergroup comprised of Johnny Cash, Waylon Jennings, Kris Kristofferson and Willie Nelson. It's almost like they were taking the piss at this point, with this horrendous second single from Oz Crawl's ill-fated Between A Rock And A Hard Place album hard to take seriously. I didn't say that all the new songs were the most memorable of Australian singles - with this follow-up to "Man Overboard" a sudden comedown for the band that'd hit the top 5 on their last outing. Despite actually having a chorus and, arguably, a better hook than its predecessor, "Idiot Grin" was possibly a little too hard-edged to be anything more than a minor top 50 entry. Meanwhile, despite being perfectly hummable, this latest GANGgajang single became the band's third straight release to peak between number 45 and 48 - no doubt a massive source of frustration for the band. Listen out for a guitar riff that sounds almost identical to one heard in their next single - the one that'd finally breach the top 40 and become an iconic Aussie classic in the process. After the biggest hit of their career, Mental As Anything also suffered a bit of a setback with this latest single. In fairness, "Date With Destiny" was the third release from Fundamental, an album that'd already spent 23 weeks on the chart - but it was also nowhere near as good a song as "You're So Strong" or "Live It Up" (which fell out of the top 10 this week). Taking all that into consideration - number 25 is not such a bad effort. Now, we get to the big guns - and our first of two new entries from big-name Australian acts with their eye firmly on the US market. Ex-Cold Chisel singer Jimmy Barnes was so intent on breaking America that his second album, For The Working Class Man, was conceived with the States in mind and was what these days would be called a deluxe edition of his debut, Bodyswerve. Seven of the tracks on Bodyswerve - including that album's three singles, "No Second Prize", "Promise Me You'll Call" and "Daylight" - were remixed and repackaged as For The Working Class Man alongside five new tracks. "I'd Die To Be With You Tonight" was one of those new songs and it became Jimmy's most successful single in Australia yet - and also his first solo top 10 hit. 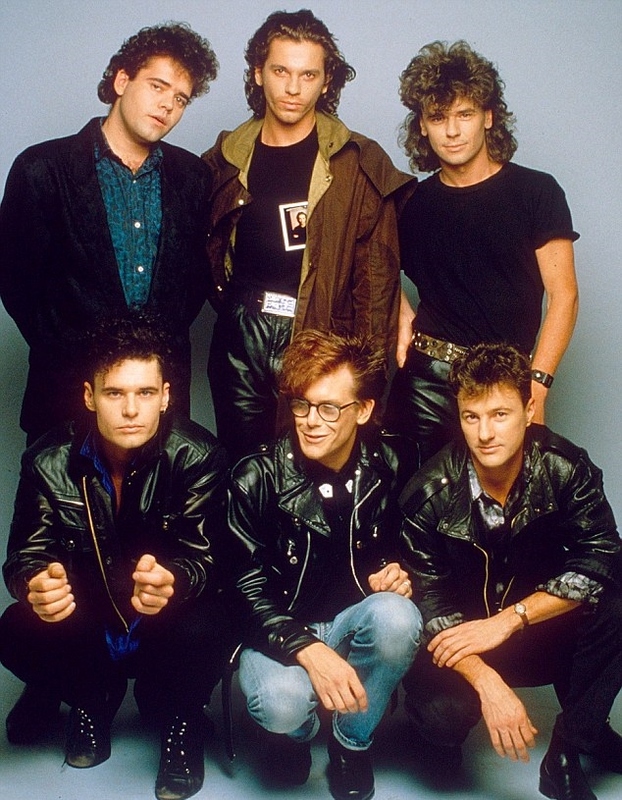 The INXS story so far: with each of their first four albums, the Aussie band's chart fortunes had improved markedly, culminating in the chart-topping The Swing, which yielded a number 1 single, "Original Sin". Clearly, INXS had conquered Australia. If it made sense for Jimmy Barnes to tackle the world's biggest music market, then that was especially the case for Australia's top band, who'd already made some inroads into the Billboard Hot 100, most notably with 1982's "The One Thing", which peaked at number 30. The last track recorded for fifth album Listen Like Thieves, "What You Need", which the band had played back in July at the Oz For Africa concert, sounded like exactly the right song with which to take on the world. Bold, brash and accompanied by a partly-animated Richard Lowenstein-directed music video custom-made for MTV, the track stormed the Australian chart at number 5 (equalling the debut of USA For Africa's "We Are The World") but was denied the number 1 spot first by Models and then by Huey Lewis & The News's "The Power Of Love". "What You Need" also became INXS's first truly big hit in the US, reaching number 5 when it was eventually released as the album's second single - "This Time" was chosen instead as the lead single in America. Surely, there was no stopping the band now. Tomorrow: INXS will also feature prominently in my regular 1990 post with another big single in their catalogue. Next week: three more Australian singles enter the top 50, including a charity release I never knew existed until now. Plus, the latest hit from the year's biggest star. The WA state chart really didn't count for much with the #1 single there barely scraping the top 50 nationally this week. I often wonder if, in examples like these, people living in Perth at that time remember the V. Capri song as being a really big hit, even though it didn't do much nationally? 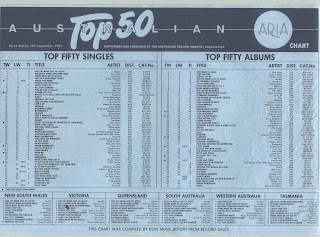 Though I doubt the state chart generated much/any publicity outside of this printed ARIA chart. 'Kayleigh' as a name sounds like 'Kylie' with a Scottish accent, though I suppose Kylie was a rare UK name prior to 'our' Kylie breaking there - with even Mrs. Bucket commenting that it sounds like the name of a foreign vegetable in a Keeping Up Appearances episode from 1990. I didn't know this song - it's not bad (the verses, anyway). The Highwaymen song doesn't sound too bad either to my ears, but a strange charting entry for 1985. I liked some of Deb Conway's solo singles, but don't really care for any Do-Re-Mi song I've heard. The GANGgajang bassline is very similar to their later single. I'm surprised the Mentals video is allowed on youtube, given some of their bigger hits aren't. Maybe they don't care about the flops being on there? I'm definitely not a Jimmy Barnes fan, but 'I'd Die To Be With You Tonight' is one of his more tolerable hits; probably helped by not being as overplayed as most of the others. 'What You Need' is not my favourite INXS track. Pity 'Original Sin' wasn't a big international hit for them, as it's probably my favourite track of theirs. Natan, I'm sure anything that managed to hit #1 on a state chart but did nothing nationally would still be remembered as a big hit in that state, since local radio stations played it enough to encourage locals to go out and buy it in droves. Those were the days before truly national programming (aside from the ABC - each state even had special Logies for most popular media personality, believe it or not! ), so local hits were common. It also wasn't uncommon for singles to peak at different times in different states, which affected their national chart performance. "Shoop Shoop Diddy Wop Cumma Cumma Wang Dang" by Monte Video and the Cassettes reached #1 in QLD, but missed the Top 10 nationally. I still remember it as being massive in QLD, though. "Love You Brisbane" was also #1 in QLD, but peaked at #59 nationally (unsurprisingly).